Banana Powder part of Ben Nye's Bella Luxury Powders gives you more thane enough reason to go bananas for these silky-fine, mattifying translucent setting powders! Blending is enhanced even when powder is applied in the "middle" of makeup. 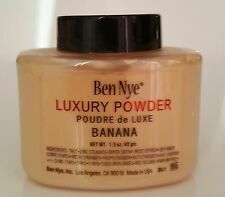 Ben Nye Luxury Banana Powder. Banana Powder part of Ben Nye's Bella Luxury Powders gives you more than enough reason to go Bananas for these silky- fine, mattifying translucent setting powders. Face Makeup Kim Kardashian. Your skin tone. 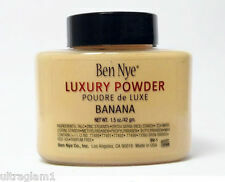 Ben Nye Banana Powder is one of that makeup product. It is one of the best powder's for the. highlight gray undertones, Banana Powder from Ben Nye is the perfect choice for you. Blending is enhanced even when. 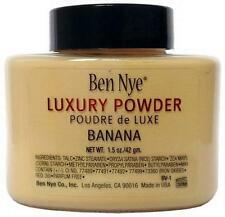 Ben Nye Luxury Powder Poudre de Luxe. 1 qty - Full Size: 1.5 oz. The versatile Banana shade suits a range of skin tones as it softly and subtly color. appearance of pores and skin texture. See what all the buzz is about in just a light dusting of Banana. A translucent powder that blends with all skin tones without diminishing the natural glow of your complexion. 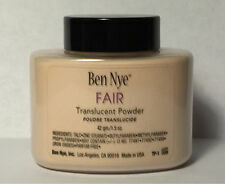 The Fair Powder is part of Ben Nye's Authentic Translucent Face Powder line. bottle of Fair Authentic Translucent Face Powder. Ben Nye banana powder. Great for setting makeup, contour, and brightening. Ben Nye Chestnut Translucent Face Powder 3 oz (TP-43). 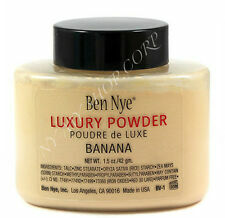 Ben Nye Luxury Banana Powder 3 oz USA. 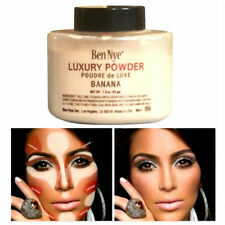 Ben Nye Luxury Banana Powder 3 Oz Bottle Face Makeup Kim Kardashian Authentic. A colorless face powder that blends with all skin tones without diminishing the natural glow of your complexion. 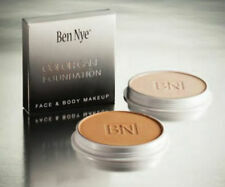 The Neutral Set Colorless Face Powder is part of Ben Nye's Authentic Translucent Face Powder line. 1.5ounce Finely milled with superb texture, Ben Nye Luxury powders, a setting powder that's as rich and warm as your skintone! Specially created for all skin tones, Ben Nye's Luxury Powders are gently tinted to enhance your natural glow, not wash it out! A translucent powder that blends with all skin tones without diminishing the natural glow of your complexion. Ben Nye Pretty Pink Translucent Powder. SIZE 1.5 OZ / 42 G.
Used for setting makeup. This is a colorless powder. 3 ounce Finely milled with superb texture, Ben Nye Luxury powders, a setting powder that's as rich and warm as your skintone! Specially created for all skin tones, Ben Nye's Luxury Powders are gently tinted to enhance your natural glow, not wash it out! Coco Tan Translucent Face Powder 3 oz. This banana shade of Ben Ny's luxury powders is slightly yellow tinted, which will enhance your skintone without over-powering it. The translucent, mattifying banana powder will create a smooth finish for your skin without clogging pore. Ben Nye LUXURY POWDER. BUFF BV-50. FULL SIZE 0.92 OZ / 26 G.
The Super White Powder is part of Ben Nye's Authentic Professional Face Powder line. shaker bottle. 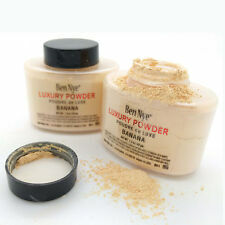 Finely milled with superb texture, Ben Nye Luxury powders, a setting powder that's as rich and warm as your skintone! Specially created for all skin tones, Ben Nye's Luxury Powders are gently tinted to enhance your natural glow, not wash it out! 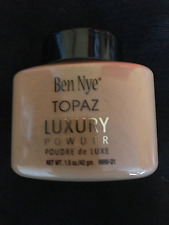 Ben Nye Topaz Translucent Powder 1.5 oz/42gm. 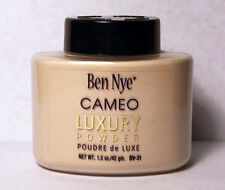 BEN NYE Luxury Powder BV-30 CAMEO .92oz NIB! Ben Nye Bella Luxury Ultra neutral powders provide superior matte and subtle finishing. Often compared to French powders with silky fine textures. Ben Nye Bella Luxury powders are translucent with just a hint of color. BEN NYE Luxury Powder MHV-0 CAMEL .92oz NIB! BEN NYE Luxury Powder BV-40 ROSE PETAL .92oz NIB! .Ben Nye Fair Translucent Powder 1.5 oz. Fair translucent powder used for setting makeup. Finely milled with superb texture, Ben Nye Luxury powders smooth skin while lightly enhancing skin tones. Topaz Luxury Powder is micro-milled for a silky texture. Luxury Powders are translucent with just a hint of color. FULL SIZE 0.53 OZ / 15 G.
The Olive Sand Authentic Mojave Luxury Powder is part of Ben Nye's Authentic Mojave Luxury Powder line. Ben Nye's ultra fine Authentic Mojave Powder will provide subtle finishing. This is a great loose powder for all skin types can be used before blush to keep it set can give a nice skin tones a cool undertone, a little oomph. Nice for enhancing very feminine look This is a Translucent powder. Ben Nye Luxury Powder BV-70 Beige Suede. BEN NYE NEUTRAL SET 8 OZ. NEUTRAL SET IS A COLORLESS SETTING POWDER.